Falcon Quinn and the Bullies of Greenblud is a humorous and hair-raising adventure that explores what it means to be different. Written by acclaimed author Jennifer Finney Boylan, the book’s monsters and their race against time aptly capture the imaginations of middle-grade readers. The Bullies of Greenblud is the final book in the Falcon Quinn series, which was inspired by Boylan’s sons and their jokes about cliques on the school bus. The majority of Boylan’s writing is aimed at adult readers and includes novels, memoirs, short stories and articles for the New York Times for which she is a contributing opinion writer. Boylan’s 2003 memoir, She’s Not There: A Life in Two Genders, was the first bestseller written by a transgender American. She has appeared as a guest on the Oprah Winfrey Show numerous times and consulted for the Amazon series Transparent. Boylan serves on the Board of Trustees of the Kinsey Institute, a research organization focused on human sexuality and relationships, and is a special advisor to the president of Colby College in Maine. As a nationally known advocate for civil rights, Boylan co-chairs GLAAD, one of the nation’s largest LGBTQ advocacy groups. The Comer Family Foundation and Boylan came together to support GLAAD’s anti-bullying work through a unique agreement—the foundation made a donation to GLAAD and Boylan wrote The Bullies of Greenblud. All of the book’s proceeds go to GLAAD. 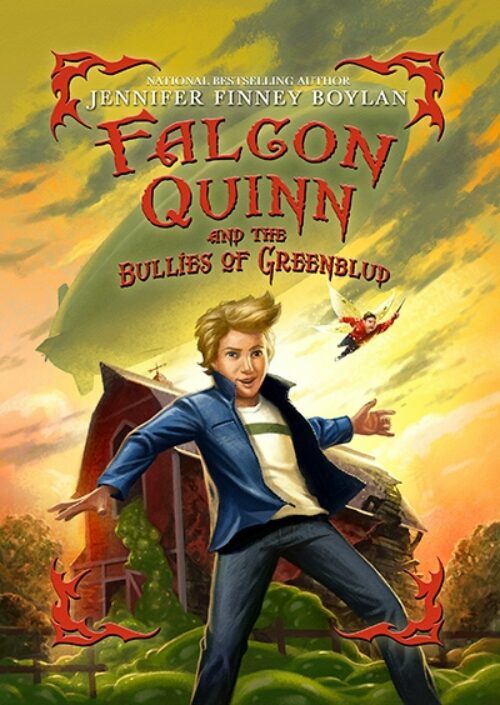 The Bullies of Greenblud is the final book in the Falcon Quinn series. Why did you become involved in GLAAD? GLAAD advocates for equality and accelerating acceptance through the media by promoting good movies, television shows, books and articles that tell [LGBTQ] stories in the right way. When stories are told in the wrong way, which is unfortunately all too frequently, we try to get publishers, authors and editors to understand why the stories are being told in the wrong way and maybe to make good on that…I got involved with GLAAD because it struck me that telling stories is a good way to change the world. My mother had a saying, “It’s impossible to hate anyone whose story you know.” I don’t know if that’s always true, but it’s frequently true. Falcon Quinn is not…none of these books are books about being LGBTQ, per se. They are books about being different. If you want, you can see being a monster as a metaphor for all kinds of things. I see it as a metaphor for being LGBTQ, but it’s really a metaphor for what it’s like to be different from everybody else. And believe me, if you’re a 13-year-old Sasquatch, you know what it’s like to be different from everybody else. Is there a message that you want to convey about being different to your readers? Be yourself. Oscar Wilde said, “Be yourself. Everyone else is already taken.” I had the experience of reading the Falcon Quinn series at elementary and middle schools across the country. It is really interesting how middle grade students relate to and understand the challenges of being yourself, because when you’re entering that part of your life, the pressures upon you to conform are pretty strong, and pretty deep. Adults can forget that at age 12, doing the thing that you want to do because it’s who you are, rather than doing that other thing because it’s popular, is a real act of courage, and it’s very, very hard. Standing up for yourself is something we need to teach our children. Just being yourself can require bravery. Is there anything that people find controversial in the book—alcohol or sexuality? If so, what would you say in response? I didn’t want to paint a picture, even in fantasy, of a world that doesn’t understand the challenges that young people are up against. So even in a world of sasquatches, vampires and zombies there has to be reality. What can the general public or supporters learn from storytelling? I think the most important challenge we face in life is to understand that the world is full of people who see the world differently than we do. We have to walk around in their shoes, get under their skin, and have compassion and imagination so that we know what their lives are like. Stories are the best way of understanding another human’s heart. I think in books like Falcon Quinn we can understand both our common humanity as well as our difference. It’s stories that open the door into another person’s life. It’s stories that enable us to get out of ourselves. It’s stories that encourage imagination. And not just imagination of fairy castles and dungeons, but the imagination of morality, the imagination of the heart. I hope that’s what people who read Falcon Quinn will find—it’s a book about monsters, but ultimately it’s a book that’s going to teach us about our humanity. What do you see as your professional purpose? Ultimately, I’m an entertainer. I think you can’t get through to people’s minds unless you’re entertaining their hearts first. I’m in a unique position because I’m a person who’s trained as a storyteller who finds herself alive at a time when suddenly there are people who have been ignored or marginalized for centuries who are at least being considered with more compassion and more dignity. It’s my purpose to tell stories, and not just my own, but the stories of lots of people like me. And by like me, I mean not just trans people, and not just LGBTQ people, but people who are different in any way. Really, who’s not different on some level? Ask anyone about their life, it doesn’t take long to find out they’re carrying a story. Everyone has a story they’re trying to tell and everyone has a burden they carry around, sometimes in secret. I hope that by telling stories like the kinds that I tell, people will understand there’s room in this world for their stories and there’s room in the world for them. You write across many categories. What unifies your writing? I guess what unifies it is the belief in a better world than the one in which we live. I have a new novel for adults called Long Black Veil…I think in Long Black Veil, as well as other work that I’ve written, you will see a belief in a better world. It’s not a world that is changed by revolution or vast sweeping changes. It’s a world that’s changed by individual actions of a few people who are doing the right thing, sometimes in defiance of duty, blood and all rationality. Sometimes people change the world just through the love that they show the most unlikely of people. We don’t go to heaven because we hate people who are easy to hate. We go to heaven because we love people who are difficult to love. I hope that in all the work that I do there is this hope that love can change the world. Boylan's books, including her new novel, Long Black Veil, are available for purchase on Amazon and at booksellers across the country.